About a week ago Bear Squad entered the Smokie Mountains. It was a steep climb from Fontana Dam and we got a late start as members of Bear Squad needed to pick up resupply boxes and secure permits to enter the park. At the park entrance there was a warning about norovirus and at that point I gave my Sawyer water filter to some passing day hikers. The sawyer is effective against cryptosporidiosis and giardia but doesn't stop viruses. Many people have said the springs are safe enough to drink from without treatment, but I use aquamira on all my water. As small as the chance of getting noro may be it's not worth spending three days evacuating all my vital fluids. Midafternoon first day in the Smokies the rain started and it hardly stopped for two days. Our hiking clothes were soaked. A frigid wind in the mornings compounded our misery. Day one in the smokies we startled a wild hog that dashed across the trail and left me clenching my sphincter. At first we thought it was a bear. Everywhere we went were signs warning us about bear activity. Two shelters were close because if bear activity and one if the shelters had an electric fence around it. Getting good information was difficult. As far as we can tell, a man had forgotten coconut chap stick or another scented item in his pocket and a bear had bitten him through his tent. We were extra careful to clap and yell as we walked through the rain and to hang all our scented items in camp. At one of the shelters a man had refused to bear bag his food and slept with skittles and bars. His behavior was erratic and he lobbed some f-bombs at the snorers in the shelter that night, briefly becoming my hero. When Cici and reached clingmans dome and the visitor center a few park rangers asked us if we were thru hikers and if we knew anything about a strange man making the other hikers uncomfortable. His description matched the man from our shelter and we all shared what we knew. Apparently the man had had confrontations with other hikers and made them nervous. At the next shelter a few Park Rangers came to ask us about the man. The consensus among their squad is that the man may have been a little unstable. It's unclear if he was a danger to others or to himself. Outside of the Smokies the weather has behaved. Cici and I have run into enough rattlesnakes to last a lifetime. One night we camped on a bald and watched the sunset. It was peaceful until we heard a loud rustling in the treeline that did not stop at our yelling and clapping. I scrambled out of the tent in my underwear and built up a fire, pointing the bear spray at shadows for an hour or so until the rustling came no more. I don't my actions had any effect but the balm of taking action was enough to soothe my nerves. An injury to my ankle and shin had me worried a few days and my pace slowed so that Cici and I fell behind Bear Squad. We became Shire Squad, a pair of hobbits on an adventure and eating ten breakfasts a morning. The injury was pure hubris, a result of running up a Mountain at full pack. Fortunately a hiker at one of our shelters was familiar with the ailments I described and the injury has since responded to treatment, viz, rest, ibuprofen, elevation, and compression. I think it will be a while before I am 100%. It seems that though our bodies grow lean and strong in the trail, the real gains are mental, learning how much to carry, how hard to push, how often to rest, and in my case not to run down the goddamn path at a hundred miles an hour for no reason whatsoever. I'm lucky I didn't hurt myself more. Related to this luck is a hiking pole I found in a stream, jutting from the ground like Excalibur. It suits me perfectly and helps keep the impact of my bad leg. We often say the trail provides and it is true. Trail magic has been abundant. 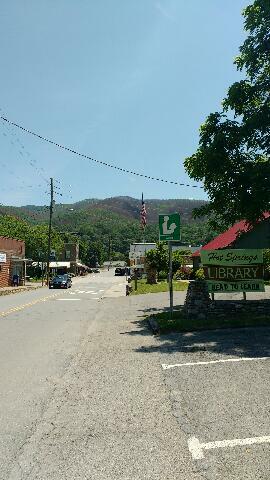 We're in Hot Springs NC now, mile 273, about to head out for our next hundred or so mile stretch. Last night we had hot food, softs beds and a shower. We washed our clothes in machines. I sat under an awning and watched a few thunderstorm, happy not to be in it. This morning we had hot coffee that didn't come out of a little packet. Civilization has its perks, but the trail calls. Something I notice is how much more consequential every action in the woods can be, and how little stress I feel. The simplicity of walking and caring for your most basic needs is seductive. The nerve wracking part of the trip so far has been checking my email in town. As always, battery life is rare and precious. Will write more when I can.